No more sponge bathes!!! If your bathing facilities are inaccessible to you, require you to leave the safety of your wheelchair or gurney, present the potential for fall hazard, or are generally inconvenient, you now have an alternative to expensive remodeling. That alternative is fold a way portable showers. Designed for use by individuals with disabilities who find traditional bathing facilities difficult or impossible to use. All models are completely wheelchair accessible and portable, NO tools or modifications to the home are necessary. 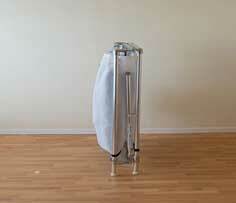 Portable showers are complete shower facilities. They can be set up anywhere, kitchen, bedroom, laundry room, rental, any place within 10-12 feet of a sink with warm running water. These units require no assembly. They quickly and easily unfold for use and then quickly refold for storage. The frames are made of unbreakable anodized aluminium, designed for long-term use. These showers can withstand multiple years of repeat use with no degradation in frame structure or function. All frames come with a full 10 year FAWSsit warranty against defects. There are currently five (5) separate models of Fold Away Wheelchair Showers which address all your needs: Primary Unit, Enlarged Primary Unit, Recliner Unit, Tall unit, and Bariatric unit. All models allow the bather to be rolled into the shower stall with a shower/commode wheelchair, or a regular wheelchair. The Recliner Unit accommodates reclining style of wheelchair or gurney. Once inside the shower stall, a front support bar is lowered so that the fourth side of the shower pan can be attached for waste water collection. A front shower curtain may be brought around for the person who is able to do their own bathing, or may be left open for easier caregiver access to assist with the bathing. Source water for the shower is any standard sink faucet. It's delivered to the shower with a 12ft shower head/hose coupled to the faucet with an enclosed universal adapter. Similarly, waste water is safely and quickly discharged back to the sink with a 12ft pump/hose and a unique no clog intake. A shower head with approximately 12 feet of hose and a universal adapter to allow for connection to the sink faucet is provided with every shower unit. And, there is a pump which pulls the waste water from the shower drain pan. There is a 12 foot hose attached to the pump unit which then returns the waste water to the sink drain for disposal. A GFI plug protects the pump unit in case of any electrical failure. To assure safety, the shower has been tested by Underwriter Laboratories (UL) and it complies with all of their requirements for safety. While primarily intended for use at home for people who cannot or choose not to do complete bathroom remodelling, portable showers are also the perfect travel shower. - Healthier skin because the entire body can have adequate water to truly cleanse. - Decreased infections because bacteria is removed with the water, and for individuals with more hair on their bodies, soap residue and other irritants are removed. - And, because of the ease of transport of the shower unit, even catheter accidents while traveling can be dealt with immediately so prolonged exposure to irritants no longer needs to be an issue. - Improved circulation with the stimulation of warm water on extremities. Or, critical body temperature cooling can be easily accomplished. Important for many quadriplegics and others who have diminished abilities to detect body temperature changes. - Improved mental and emotional health in knowing that hygiene is more than just adequate. SAFE for both the individual with the disability and the care attendant because no transfers or lifts are required to get into a tub or shower. Simply roll the individual into the shower, and once they are bathed, roll them back out to be dried and dressed. © 2019 Aging In My Place. All rights reserved. Aging In My Place Mobility Services LLC.